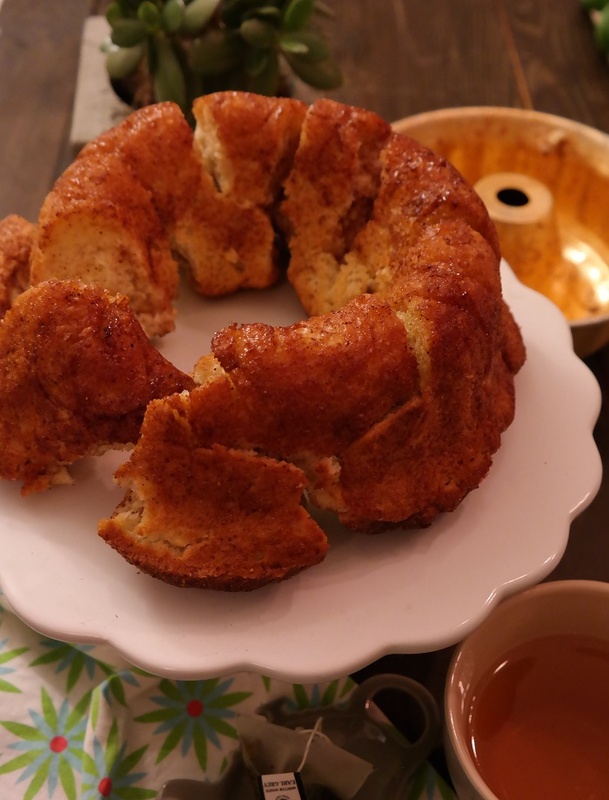 Pillsburys Classic monkey bread is a sweet pull apart bread made with biscuit dough baked in a bundt pan. 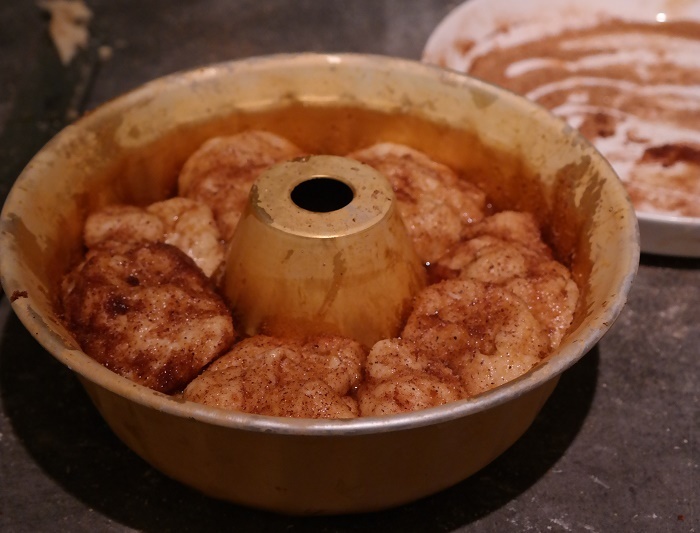 I was making sweet buns and wanted to do it a little different and thought why not make monkey bread. 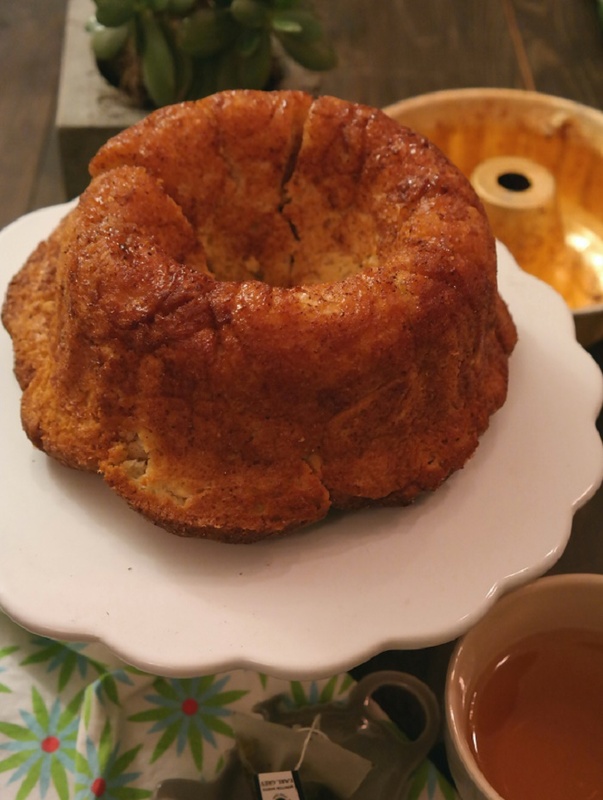 Monkey bread is a giant cinnamon roll, slathered with a sweet glaze, I did not glaze my monkey bread, I have to be carefull when it comes to sugar. In a large mixing bowl, dissolve yeast in warm water and some of the sugar., stir and let it sit for a few minutes. Add the milk, melted butter, sugar, eggs, salt, and 3/4 of the flour. Mix and add enough of the remaining flour to form a firm dough. Turn the dough onto a floured surface. Knead until smooth and elastic, about 5 minutes. Do not over-knead, which will yield a tough, chewy bread. The dough is ready when it is smooth and when you can poke it with a finger and it springs back. Form dough into a smooth ball and place into a large greased bowl, turning once to grease the top. Cover with plastic wrap or aluminum foil and let it rise to double size. melt 50 g of butter in a small bowl. 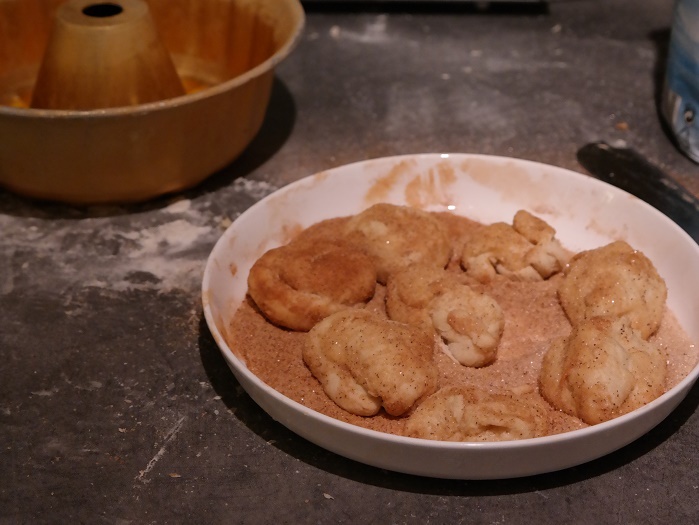 Mix granulated sugar and cinnamon together in another small bowl. Set aside. You will use the rest of the butter, brown sugar, and vanilla later. Grease a large or two smaller bundt pans with melted butter, set aside. Punch the dough down gently to allow the air bubbles to release. Pull apart pieces and roll into balls, about 1.25 inches in diameter. Dip each ball, one by one, in the melted butter and then generously roll in the cinnamon-sugar mixture to coat them. You may need more cinnamon-sugar depending how heavy you coat each ball. Arrange them in the bundt pan as you go, cover the pan and allow dough balls to rise again for about 45 minutes at room temperature. Preheat oven to 180C . Bake for 30-35 minutes or until golden brown on top. Cover loosely with foil if the top browns too quickly. Cool for 5-10 minutes and invert onto a large serving plate. If you have any butter left over combine it with a little sugar until sugar is dissolved. Pour the buttery mixture over the dough balls in the bundt pan.